This entry was posted in Histronomics and tagged bayh-dole act, innovation, research. Bookmark the permalink. The number of patents is a measure of what has been diverted from the public domain, from the federal patent commons, and from individual inventors to institutional control. The measure of Bayh-Dole’s success–on its own terms–is practical application of inventions. There, the university-brokered commercialization rate was 25% or better before Bayh-Dole, and is around 0.5% now. 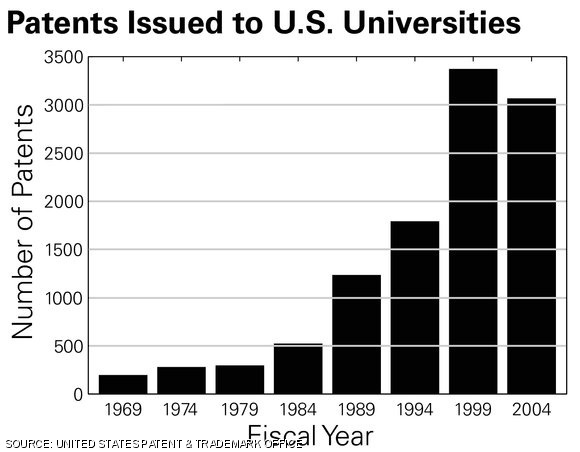 Before Bayh-Dole, there was the Institutional Patent Agreement program–from the mid 1950s to 1978–for HEW and NSF, the two agencies that dealt most with universities. The IPA program allowed institutional ownership as well. Its commercialization rate was about 4%. Bayh-Dole surely did motivate universities to file way more patents. But is that a measure of its success?